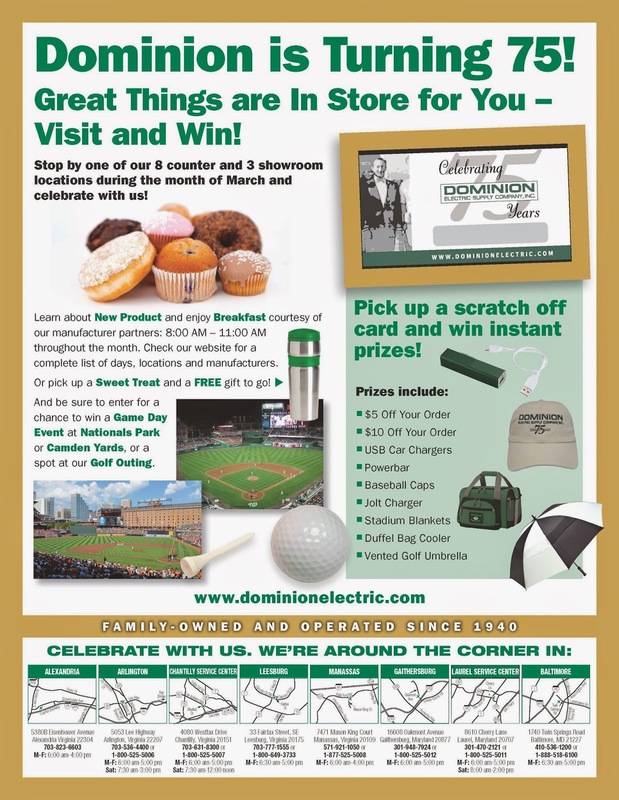 Enlightening (Residential Lighting Blog): Dominion is turning 75! And we are having a month long celebration! Throughout the month learn about New Product and enjoy Breakfast courtesy of our manufacturer partners: 8:00 AM – 11:00 AM on the counters. Pick up the complete schedule HERE. Manufacturers hosting events include: 3M, Arlington Industrieis, Burndy, Greenlee, Ideal, Intermatic, Killark, Klein, Leviton, Milwaukee Tools, Progress, RAB, and RACO; and in the lighting showrooms so far, you can meet with Capital and Quorum from 11:00 a.m. - 1:00 p.m. As we add manufacturers, we will update our website and schedule. Please check back in to get the latest information. Also inStore - pick up a scratch off card and win instant prizes. Or a Sweet Treat and a FREE gift to go! And be sure to enter for a chance to win a Game Day Event at Nationals Park or Camden Yards, or a spot at our Golf Outing.